I am sure that some readers will have been attracted by the word "Salonica" because their ancestors came from this bustling Aegean port, having established themselves there in the wake of the expulsion from Spain in 1492. They thrived for many centuries, but a community battered by the great fire of 1917 and the aftermath of World War I was effectively destroyed by the Holocaust. However, Columbia University historian Mark Mazower, who has written extensively about the Balkans, is not writing Jewish communal history. He has set himself an awkward challenge: to write "a single encompassing historical narrative" composed of the experiences of Christians, Muslims and Jews that would do justice both to the times they lived together peacefully, even interdependently, and the times of tension and strife. The task is difficult in that he has had to work with sources that concentrate on one community to the exclusion of others. But he adds perspective by contrasting and blending his material with his extensive knowledge of Balkan politics and the impact of nationalism, and has a good sense of how to read significance into seemingly unimportant incidents. In this way Mazower captures the volatile ethnic and religious chemistry of a city whose overriding commercial purpose helped to dampen dangerous feuding. The main factor in keeping the peace was a strong central authority, and for most of the period covered by Mazower, the Ottoman Empire provided it. It also provided the hard Muslim core of the city after its conquest from Byzantium in 1430. Salonica welcomed the Jews fleeing the Iberian peninsula, seeing their skills as craftsmen, armorers and traders as a means to further revitalizing the strategic port. Within a couple of decades Jews were effectively running the local economy. Thus by the middle of the 16th century all the elements were in place: a favored Muslim majority, a prosperous Jewish community, and a small, somewhat dispirited, body of Greek Christians left over from the original inhabitants. Imposing order was an Ottoman authority willing to grant considerable autonomy to the various communities in return for their loyalty and obedience. This period was not idyllic. Plague, dissension within the communities (particularly the problems caused among the Jews by the false messiah Shabtai Zvi) and economic downturns took their toll. But foreign invasion never threatened the city walls, and control of the city by the local pashas was firm without being tyrannical. The Ottoman empire weakened from the 18th century onwards, and its European possessions dwindled. Salonica itself was threatened by Albanians, the new Greek state and even the Janissaries, its own defenders, before they were dissolved. Now the port attracted the traders of the European powers, looking for new markets. Salonicans learned their languages and customs, and absorbed some of their secular philosophies, to the fierce opposition of local religious leaders. Demands for reforming the local administration were heard in an effort to reverse Ottoman decline, and foreign ambassadors acquired considerable authority. As Mazower notes, "the ways of European bourgeois life were slowly erasing the old markers of religious and communal difference." However it was the late 19th and 20th century that was to see the most dramatic changes. The spread of nationalism produced new allegiances and loyalties. Instead of Ottomans of differing religious beliefs, suddenly there were Greeks, Turks, Bulgarians and Macedonians. Under this pressure, coupled with the western-oriented middle-class drive for reforming the empire and local maladministration, the old order crumbled. When Sultan Abdul Hamid was deposed in 1908 by the Committee for Union and Progress, the city rejoiced at what it saw as a new era. Indeed it was, but the rejoicing was misguided. Four years later, Greek armies ended Turkish rule. The Muslim population stayed put, only to be expelled in the aftermath of World War I as continued fighting between Greece and Turkey resulted in a population exchange: Greek communities evicted from Anatolia replaced them in the city. While Jews adapted to Greek rule, nationalist propaganda was a constant source of tension. Then came World War II, and the Germans. A community that had thrived for 450 years was almost annihilated in two months in 1943 at Auschwitz. Salonica had become wholly Greek, and has remained so ever since. At least, in part due to the swift intervention by British troops in 1944 blunting an armed Communist uprising, it did not end up on the wrong side of the Iron Curtain. Today it prospers once again. What, if anything, is the moral of all this? Salonica, as a trading center, depended on coexistence more than most places. A census taken by the Greeks soon after they took over the city revealed that the various groups were not hemmed into ghettos, though each had its favored areas of settlement. Conversions were rare. But against this must be set tension and violence, especially in the 19th century, when Ottoman authority ebbed. Yet the great expulsions and slaughters of the 20th-century were made possible thanks to external conquest and conflict. The Greek-Turkish war made Salonica a Greek city. The deportation and murder of the Jews was carried out almost exclusively by the Germans, with little help from the generally shocked and disapproving Greeks After the war, though, the locals held on to abandoned Jewish property tenaciously. The author, in a moving epilogue to a well-written and fascinating study, suggests that Salonica's multi-ethnic history may serve modern day Greece. "Nation-states construct their own image of the past in order to shore up their ambitions for the future. But today the old delusions of grandeur are being replaced by a more sober sense of what individual countries can achieve alone." A past of intercommunal dependence, in short, may serve a future of international cooperation. Each community projects some pride in itself and its uniqueness into its history, and provided it avoids lies and delusions, I doubt that it does harm. Christians, Muslims and Jews enjoyed a great, occasionally overweening, sense of their own importance, yet this did not prevent them from getting along with each other most of the time. The main threat to coexistence, if Salonica's history is any guide, is the breakdown of the overall authority and guiding philosophies that make it possible in the first place. In the resulting chaos, anything can happen. Ottoman history is a seductive topic. This is true partly for reasons of the empire’s obvious geopolitical interest—its successor states include present-day Turkey, Iraq, Israel, and Libya—but perhaps in greater part because of the richness and rococo intricacy of the societies over which Constantinople long ruled. In City of Ghosts, Mark Mazower offers up a particularly exotic slice of Ottoman life, a detailed panorama of the city of Salonica, once the empire’s chief European port, now a largely ignored corner of northern Greece. A professor of history at Columbia and director of the university’s Center for International History, Mazower first gained attention with Inside Hitler’s Greece (1993), an elegant if overly romantic account of Greek resistance to German occupation during World War II. He recently served on a Columbia committee that investigated, and largely exonerated, faculty who were accused of intimidating Jewish students. Mazower’s new work again shows him to be an accomplished practitioner of historical narrative—and an unreliable judge of historical culpability. Named after the daughter of Philip of Macedon and the half-sister of Alexander the Great, Thessaloniki (as it is rendered in Greek) was a substantial commercial and political center in the ancient world, as well as an important center of Christian learning in the Byzantine Empire. An impoverished town by the time the Ottoman Turks sacked it in 1430, Salonica would likely have seen its fortunes wane permanently had it not been for an act of religiously motivated folly: Spain’s expulsion of its Jews in 1492. Spain’s loss was the Ottomans’ gain. The Sephardim not only revived Salonica, they made it into a remarkable Jewish enclave nestled between a Muslim empire and the largely Christian Balkans. Before the foundation of Tel Aviv in 1909, Salonica was the only city in the world whose main language was Jewish, in this case Judeo-Spanish, commonly known as Ladino (the Iberian equivalent of Yiddish). It was a city whose port closed on the Jewish Sabbath, when most of its stevedores rested. Despite being second-class subjects in a Muslim state, Salonica’s Jews carved out a remarkable degree of autonomy for themselves. The Ottomans tacitly supported the rabbinic courts, even though these bodies had no formal legal standing. And the city’s rabbis, though nominally answerable to the chief rabbi in the Ottoman capital, wielded extraordinary local powers. Salonica was governed very informally. The police force, according to Mazower, consisted of little more than a nightwatchman paid by local merchants to wander the streets, his “metal-tipped staff tapping out the hours on the cobbles as he made his rounds.” The city was also disastrously overcrowded, resulting in devastating fires that would sweep periodically through the wooden shacks occupied by the poor. Conflagrations were such a fixture of Salonican life that, on Yom Kippur, the city’s Jews would pray for divine protection from them. The Ottoman era ended when Greek troops entered the city in October 1912. At this point, Mazower changes course, providing less a history of Salonica or of the interplay among its ethnic components than an account of the often difficult relations between, in particular, the Greek state and the city’s Jews. At the time, just 25 percent of Salonica’s inhabitants were Greek Christians, a fact of great concern to its new rulers. As one officer observed, Salonica was a “gaudy city with all the tribes of Israel,” a place with “nothing Greek about it, nor European.” So the Greek government set about “Hellenizing” Salonica with the usual tools of the nationalist state, imposing the Greek language, which was known by few of the city’s residents, and changing street names. An opportunity to do still more came in 1917, after the last of the great fires. With half of the population homeless, and most Jews without shelter, the Greek authorities swept away the charred remnants of the Ottoman city, replacing it with a French-style metropolis of broad, straight boulevards. Engineering of a different sort was applied to Salonica’s population. New housing estates were filled with Greek Christian refugees. These had arrived in large numbers after World War I and the failed Greek attempt to resurrect the Byzantine Empire by conquering western Turkey. In 1923, the city’s Muslims were forced to move to Turkey as part of a population exchange. The minarets once vilified by a Greek journalist as “the symbols of a barbarous religion” were demolished, stripping Salonica of the most visible aspect of its Ottoman heritage. With the Muslims gone, the Jews remained the only substantial non-Greek element in a city whose identity and appearance had changed drastically in just over a decade. Increasingly marginalized, many Jews emigrated. Most of those who remained met their end in 1943, with deportation to Auschwitz. As Mazower reports in his brief account, the Nazis (who had conquered Greece in 1941) succeeded in murdering over 90 percent of the 50,000 Jews living in Salonica on the eve of World War II. City of Ghosts is a clearly written and engaging book, even picturesque at points. Had it ended with the Greek conquest of Salonica in 1912, it would rank as a solid contribution to the field. Mazower is convincing in his portrayal of Ottoman society as neither an unrelenting hell for non-Muslims nor a happy, American-style melting pot. Where he fails is in tackling the modern era and the issue that makes historians of 20th-century Greece positively skittish: Greek anti-Semitism and the Holocaust. In City of Ghosts, Mazower concedes that some of these conclusions were perhaps premature. As the records demonstrate, it was indeed Greek Christians who destroyed Salonica’s Jewish burial ground; some of them, he notes, also collaborated in the Nazis’ program of extermination. But even here, Mazower’s keynote remains the same: the heroic role of Salonica’s righteous Gentiles in trying to save their doomed Jewish neighbors. Setting the record straight about the Holocaust in Salonica is not only a matter of doing justice to the city’s important Jewish legacy. It bears directly on present-day issues as well. In Greece, public discussion of the role of Christians in delivering Jews to their deaths at the hands of the Germans remains taboo. Some Holocaust memoirs have been “edited” to remove or tone down passages dealing with collaboration. Unfortunately, Mazower has skirted these issues, preferring instead to make spurious historical comparisons. Thus, in City of Ghosts, he asks if the “function” of the Israeli office handling Palestinian property after 1948 was so different from that of the Greek agency that seized the property of Salonica’s Jews after they were deported to their deaths in 1943. Both, after all, “systematized the violence of dispossession and sought to give it a more lasting bureaucratic form.” To which one feels obliged to answer: yes, they were different indeed, as wartime dislocation, whether through flight or expulsion, is different from genocide. So gross an instance of historical obtuseness could be ignored if it were not part of a larger picture, but Mazower has made a habit of reviling Israel. In an extraordinary article in the Financial Times, written just months after 9/11, he portrayed Israel as a colonial and imperialist state, comparing its occupation of the West Bank to, among other invidious precedents, Hitler’s seizure of Poland. Two years later, Mazower could be found in the pages of the Times of London, opining that the main threat to Jews today was not anti-Semitism, Arab or otherwise, but the policies of Ariel Sharon. 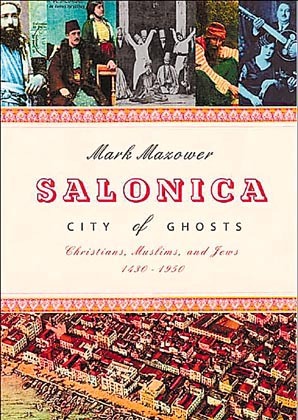 Salonica may be a city haunted by ghosts, as Mark Mazower would have it, but the ghost haunting his book is a very old hatred, one that sealed the fate of Salonica’s Jews and even today remains unrecognized in far too many quarters. Andrew Apostolou, a new contributor and a historian of the Holocaust in Greece, works at the Foundation for the Defense of Democracies in Washington, D.C., where he writes on terrorism, Iraq, and Central Asia. Two decades ago the young Mark Mazower hoisted his rucksack on to his back and walked away from the railway station into the city of Salonica. He had never been there before, but in all the years since then he has been gestating this tremendous book about a city unique not just in Europe, but in the entire history of humanity. Mazower was to become, of course, an eminent academic historian, and Salonica is a perfect subject for his gifts. Once Byzantine, in 1430 it was taken by the Ottoman Turks, and became a famous outpost of Islam on the edge of Europe, although enriched by such an influx of Jewish refugees from Christian Spain that they actually formed a majority of its population. In 1912 the Greeks returned in force to expel the Muslims, and in 1944 the Germans came in and exterminated virtually all the Jews. So, standing there battered by centuries of experience at the head of the Aegean, Salonica provides marvellously allegorical material for a 21st-century chronicler. The book really is a chronicle. Despite its subtitle it is essentially a historical register of events, not (as its blurb suggests) an evocation. Mazower has evidently revisited the city innumerable times since he first turned up with his backpack, but he is no Leigh Fermor, and does not pretend to any aesthetic subjectivity. What he does to perfection is to express the historical meaning of Salonica down the generations, authenticating his story with a multitude of contemporary quotations, from the 15th to the 20th century, and scrupulously explaining it all out of his profound scholarly knowledge. The topical allegories of his tale are all too obvious. For five centuries Salonica was ruled by an empire, under the Islamic sultans in Constantinople, but it was generally inhabited by people of three religious faiths - Muslims, Christians and Jews. For the most part they lived peaceably. Every kind of calamity threatened them, all the dynastic and imperialist passions of the times swirled about them, but on the whole, while the power of the empire held, religious tolerance prevailed. Minarets replaced Byzantine church towers on Salonica's famous skyline, some churches became mosques, but in general the apparatus of Orthodox Christianity was left intact, and Judaism thrived. As the western world lurches ever deeper into its anachronistic conflict with Islam, we may interpret this story as a lament for Islam's lost grandeur, and indeed some of the saddest passages in Mazower's book concern the banishment to Salonica of the last memorable sultan, Abdul Hamid II, at the secular hands of the Young Turks in 1909. He was a ruthless despot, but as the story of the empire itself approaches its end, the account of his exiled years has an air of threnody for what had once been great: there he lived among his guards in his villa among the pine trees, with his three wives and his four eunuchs, doing carpentry, experimenting and playing with his cat. He was not allowed to go to the mosque. A parallel allegory of Salonica concerns nationalism. This was for centuries a city of three faiths, three races, but it was never fused into a true unity. Its cultures co-existed, but seldom mixed. They spoke their own languages, honoured their own customs, lived in different districts - "a juxtaposition of tiny villages", wrote one citizen in 1911, each keeping "well away from the others, as if fearing contagion". This was fertile ground for the seed of nationalism, when it was sown throughout Europe. Even in 1911, it seems, the several ethnicities of Salonica, so long restrained into tolerance, had learnt to call themselves "nations"; and it was the burgeoning idea of nationality that inflamed the tragic Balkan wars of the 1900s, eventually destroying the Ottoman regime and bringing disaster to Salonica itself. The discipline of empire had held the city together - an empire that specifically recognised the right of the three religions to coexist under its aegis. Is this, one is tempted to wonder, a legitimate argument for imperialism itself, as some Americans might claim? It is certainly true that the neighbouring empire of the Habsburgs was a patchwork of separate peoples - later nationalities - orchestrated into harmony by its central power. True too that when the Greeks inherited Salonica from the Ottoman empire the old balance of the city immediately collapsed: nearly all the Muslims were sent away to Turkey, almost all the Islamic buildings were destroyed and an overwhelming programme of Hellenisation was enforced - so overwhelming that in Salonica today there are few traces of the long Islamic past. But no, in Salonica's context as in all others this theory of empire is too good to be true, and the next new order to fall upon the city demonstrated the ultimate flaw of the imperialist ideology - its inevitable misuse of power - by snatching several thousands of its citizens, packing them away to distant Poland and murdering almost every one of them. It was only an incidental of religion, an item of Islamic dogma, that made the dominion that for so long ruled Salonica a relatively equable authority. And if this particular benevolence provides an honourable frame, so to speak, for a historical survey of Salonica, Mazower makes it plain that by no means every detail was as encouraging. Dear God no! The pages of his book are awash with bloody confusions. As his tale calmly unfurls itself (there are 537 pages of it, which occasionally does come to feel rather too many) we read of bandits, plagues, wicked janissaries, apostates in one direction or another, calamitous fires, poor multitudes of refugees, massacres, famines, vagabond monks, false messiahs, murders, a myriad corruptions and more than one failed city plan. In 1920 an American observer wrote that the Salonica scene reminded him of a "soap opera" (surely a very early printed use of the phrase) and although the analogy seems too frivolous now, the history of this city does still seem like one long theatrical fiction. Today Salonica is almost archetypically Greek, full of archetypically Greek 20th-century architecture - the second city of the Greek republic, and not the most beautiful. Its once celebrated skyline, rivalling Constantinople's, was spoiled by the removal of the minarets, of which only one is left. Nineteenth-century travellers were ravished by the romantic spectacle of them, as they were delighted by the orientalism of the city itself, with its mysterious and lascivious suggestions of the east. No travellers talk of them now, and the very reputation of Salonica has gone into retirement. For today multi-ethnicism is the norm, and a fast-growing modern Salonica is more like any other city than it was in the high days of its destiny. Mazower dutifully ends his narrative with brief summations of its recent progress, but they can only come as anticlimax to the terrific events of its past. He has done the old place proud anyway, and has celebrated once and for all the mighty and fateful heritage of its citizens - fated as they were to be not only Muslim Turks, Christian Greeks or Jewish Hebrews, but by the grace or sentence of history, Salonicans. Noel Malcolm reviews Salonica, City of Ghosts by Mark Mazower. There is a strange symmetry between the modern histories of Greece and Serbia: both are countries which never really knew where they ended. In the 19th and early 20th centuries they kept extending their territories step by step, until, by the last stage of their expansion, they were taking in huge swathes of land where Greeks or Serbs were only a small minority. In most of the northern territories seized by Greece (from the Ottoman state) in 1912, Greek-speaking villagers were heavily outnumbered by a combination of Slavs, Turks, Albanians and Vlachs. Many years of "Hellenisation" lay ahead - some of it well-intentioned, much of it brutally heavy-handed. Personal names and place-names were changed; local languages were suppressed; non-Greek inscriptions were even chiselled off old gravestones. To a Greek official or politician contemplating the difficulties of Hellenisation at that time, however, the problems of the countryside would have paled by comparison with those of Salonica, the most important city gained in the war of 1912. For here was a great metropolis in which the absolute majority of the population was neither Greek-speaking nor Orthodox; nor, for that matter, were they Turks, who might now be persuaded to remove themselves to Turkey. Salonica was in fact a Jewish city, and the Jews had formed the majority there for roughly 400 years. The language they spoke was (more or less) Spanish; after the expulsion of the Jews from Spain in 1492, thousands had fled to the Ottoman Empire, where they found more tolerant treatment than anywhere in Western Europe. The Sultans had encouraged them to settle in Salonica, to strengthen it as a centre of trade and manufacture. And there they both preserved their customs and language, and developed a kind of symbiotic relationship with the dominant Ottoman culture. Occasionally that symbiosis could take surprising forms. The most extreme example was the religion of the "Donmes", the followers of a Jewish pseudo-messiah of the late 17th century: these people, who were still a significant element of the city's population in the early 20th century, conformed officially to Islam but combined this with elements of Jewish doctrine and observance. But you would have a hard job finding any Donmes in Salonica today. Indeed, you could walk for many hours through this city without seeing the slightest trace of its Jewish history. (Here and there you might notice some old stone slabs which, if only you could pull them up and turn them over, would reveal Hebrew grave-inscriptions on the other side.) Yet the obliteration of the Jewish past was due, in the first place, not to official Hellenisation, but to two quite different things: the great fire of 1917, which destroyed the Jewish heart of the city, and Hitler's Final Solution, which eliminated most of the Jewish population. Compared with these, official Hellenisation was very much a secondary phenomenon. But it too had its effects, not so much on living people as on the evidence they had left behind. Just as minarets and Muslim graveyards were demolished to erase the traces of the Turks, so too the physical witness to Jewish culture was eroded, dismantled or "released" for redevelopment. Salonica is thus, as Mark Mazower's title puts it, a "city of ghosts": there can be few cities in modern Europe whose present identity is built, so to speak, on such a deep foundation of absence. His fascinating study brings to life many of those absent elements, and helps to explain the processes by which they were removed. This is not, however, quite the history of Salonica from 1430 to 1950 that is suggested by its title. The book is chronologically very unbalanced: the first 400 years are cantered through in roughly 110 pages, and the great bulk of the book is devoted only to the last 100 years. Mazower is primarily an expert on modern Greece, and he seems much less at home when dealing with Ottoman history: Turkish terms, for example, appear in an odd variety of spellings, and while some are wrongly explained, others are not explicated at all. It is not possible to understand the workings of any Ottoman city without looking closely at the powerful trade-guilds, which influenced so many aspects of city life; Mazower spends just three sentences on them. (This contrasts strangely with the many pages he devotes to the minutiae of Victorian tourism, or to the cinemas, dance-halls and brothels of the 1920s.) His treatment of cultural life in the early period is also very thin; the Hebrew printing-press, which operated from the extraordinarily early date of 1515, surely deserves more than one vague, undated mention. The great strength of this book, however, lies in its treatment of the period from the late 19th century to the Second World War. Not only does Mazower vividly describe the impact of external events on Salonica: the Russo-Turkish War, the Balkan Wars, the occupation by Allied troops in the First World War, the great fire, the population exchange with Asia Minor, the Nazi occupation. He also sensitively analyses the internal debates and divisions which could be found within all the major communities: pro- and anti-Zionists among the Jews, supporters and opponents of Venizelos among the Greeks, and so on. There is much to be learned from this book by readers of all sorts - especially, perhaps, by Greeks, whose official version of the past has never freed itself from the assumptions and requirements of the old Hellenisation process. But although some nationalist Greeks will probably attack Mazower for exposing the selectivity of their country's national memory, it might be argued that he has treated one of the most awkward questions in Greek history with some indulgence. For the issue of Greek anti-Semitism (a minor phenomenon, but occasionally important in this story) is not properly explored here: hostility to Jews is given, whenever possible, a political explanation, and the nature of its Orthodox religious background is not investigated. Still, there are enough ghosts to be getting on with in this book - perhaps that would have been a spectre too far. Noel Malcolm's books include 'Bosnia: A Short History' and 'Kosovo: A Short History' (Pan). EIGHTY years ago, workers from Save the Children, a British charity, were labouring in Salonika harbour to succour the hundreds of thousands of Greek refugees from Anatolia who had turned the warehouses into homes, freezing, insanitary and rife with typhus and smallpox. At the same time, a huge wave of forced migration went in the other direction: Muslims from the city and its environs were being shipped away to Turkey, under a Greek-Turkish (or more precisely Christian-Muslim) exchange which made both countries ethnically much more homogeneous. Two decades later, the old, multi-ethnic character of Salonika took a final, devastating blow. From March 1943, some 45,000 members of the Jewish community, which had dominated the city's life for much of the previous 500 years, were taken away to Auschwitz and gassed. While a recent inflow of migrants from eastern Europe has restored to Salonika some of its old diversity, not much in today's spanking modern city reminds the visitor of a rich, cosmopolitan past: only the ghosts evoked by an occasional Jewish or Ottoman building, if you are sensitive to that kind of thing. Mark Mazower is prodigiously endowed with that sensitivity. He has produced a brilliant reconstruction of one of Europe's great meeting places between the three monotheistic faiths. As Mr Mazower shows, many of the Iberian Jews who arrived in the late 15th century, fleeing Christian persecution, were already the products of religious ambivalence. Some were from families which had converted provisionally to Christianity but re-embraced Judaism; a few were dissident Christians. Against a backdrop of spiritual ferment in the 17th century, many followed Sabbatai Zevi, a Jewish scholar, who proclaimed himself Messiah and eventually embraced a form of Islam. In popular piety, much overlap existed among the faiths. The tomb of Saint Dimitrios, regarded by Christians as the city's protector, was inside a mosque where both Christians and Muslims went to seek blessing. Patricia Storace is the author of "Heredity," a book of poems, and "Dinner With Persephone," a travel memoir about Greece. "The Capital of Refugees" is the name the Greek novelist Giorgos Ioannou gives Salonika, the Hellenistic, Roman, Byzantine, Ottoman, Jewish and now Greek city situated on the Via Egnatia, the Roman road that led from Italy into Anatolia. Named for Alexander the Great's half-sister, Thessalonike, Salonika was an umbilical center of trade between the Mediterranean and Central Europe and was destined to be a ville fatale — the object, throughout its history, of ambitious makers of empires both temporal and spiritual. Nearby, St. Paul made his first European converts; his first epistle to the Thessalonians contains imagery underpinning the currently fashionable Rapture theology. Salonika was also the rose that God offered to the Ottoman Sultan Murad II in a dream; Murad would go on to conquer it in 1430, the year in which this superb, elegiac and essential biography of the city opens. For the Iberian Jews whom the sultan invited to settle within his borders after their expulsion from Spain in 1492, Salonika was the "Jerusalem of the Balkans." As late as 1912, they were the largest ethnic group in Salonika, and the city docks came to a standstill on the Jewish Sabbath. Mustafa Kemal (later known as Kemal Atatürk, founder of the Turkish republic), lamented to a friend, "How could you leave Salonika, that beautiful hometown of ours?" after the Greeks claimed the city in 1912. For the historian Mark Mazower, however, Salonika is a "city of ghosts." Salonika has engaged Mazower's attention since he first visited it as a backpacking student more than 20 years ago. In the ensuing decades of fruitful preoccupation with a place he clearly relishes, he "noticed how seldom standard Greek accounts of the city referred to the Jews," while the "imagined city" of Jewish scholarship "was as empty of Christians as the other was of Jews. As for the Muslims, who had ruled Salonika from 1430 to 1912, they were more or less absent from both." Here too were the Ma'min, a sect of Marrano Jews who embraced Sabbatai Zevi, the 17th century messiah from Smyrna, and followed him into Islam when he converted. In an ironic sense, his messianic claim turned out to be true: Not only did the Ma'min become a highly successful component of Salonikan society, but they were deported to Turkey during the Muslim-Christian population "exchanges" in 1923 and thus were spared an encounter with the Nazis, who occupied Greece during World War II. Using various archival sources — records that surfaced in Istanbul's Topkapi Palace in the 1940s; 18th century diaries; "dusty unopened sacks of documents" in Athens detailing actions of the "Service for the Disposal of Israelite Property," which the Germans organized in the brief time it took to deport a fifth of Salonika's population to Auschwitz — Mazower unearths surprising, invisible Salonikas. In a remarkable display of historical craftsmanship, he resurrects the city's manifold ghosts, so notorious for their presence that exorcisms of newly acquired houses occurred even in the 20th century. Mazower brings Ottoman Salonika to life, with its minaret-studded skyline and houses ornamented with verses from the Koran. The minarets would be destroyed after the Greek victory in 1912, a decision described several years later by a former Greek prime minister as an act of "coarse [and] mindless chauvinism." The Sephardic Jews who arrived in the 15th and 16th centuries created a miniature Iberia, still intact and Spanish-speaking in 1892, according to the Spanish journalists who visited the city that year to mark the 400th anniversary of the expulsion. The Ottomans administered the city, while the Jews ran its economy, taking advantage of their diaspora connections throughout the Mediterranean and becoming the Ottomans' favored minority. Mazower notes that they "combined commerce with espionage and ran the best intelligence networks in the entire region." Under the Ottomans, Salonika's society was organized along hierarchical but not completely inflexible religious lines, with Christians "constantly reminded that theirs was a second-class faith." Clerics had almost dictatorial power over their religious communities, governing them according to each sect's laws and acting as tax collectors, with far-reaching and startling cultural consequences. Rabbis could paralyze the local economy by occasionally threatening excommunication of Jews who traded with Christians. Glass windows were not a welcome innovation, because of Muslim fears that their households' women would be exposed to the gaze of strangers; newspapers also were late arrivals, "held back by the obstructive attitude of the local rabbinate." Salonika's diverse communities produced little if any secular literature of significance, though there has been a late flowering in the 20th and 21st centuries. Mazower's profound commitment to scholarship compels him to ask painful questions. He confronts the lack of discussion in Greece about the compulsory departure of Salonika's Muslims in 1923, concluding that "[t]heir experiences are still overshadowed in the public mind by the simultaneous suffering of the Greek refugees who took their place." He examines the diverging political interests and social ambitions of the Ottoman Jews, who were deeply loyal to the empire, and the Greeks, ambitious for their own state, in recounting the troubled relations between them. And he notes the consequences to "a city's consciousness of itself — especially to a city so proud of its past — when substantial sections were at best allowed to crumble away, at worst written out of the record." Salonika was a city of truncated cosmopolitanism. "The most diverse civilizations shared [the city] but did not penetrate one another," a local scholar wrote in 1914. The Nazis marveled that Salonika's Jews had never been shut up in a ghetto — but, in a sense, each of the city's communities was itself a ghetto. "Jews, Orthodox, Donmehs [the followers of Zevi], Muslims lived side by side, without mixing, each shut in its community, each speaking its language," wrote the same scholar. A city newspaper of 1911 described Salonika as "a juxtaposition of tiny villages." The vision of a less stratified social world came too late, when the region was already splitting into the relatively homogenous ethnic nation-states of today. The Muslims of Greece and the Christians of Turkey would experience their own bitter expulsions, exiled from their homelands in the compulsory population exchange of 1923. Fewer than 5% of Salonika's Jews survived the Nazi deportations, and with that, the last of the polyglot, ethnically and religiously complex Ottoman Salonika was destroyed. The Salonika that we know today is, paradoxically, an entirely new city — a "contemporary icon of antiquity," in Mazower's brilliant phrase, "a symbolic space … defined and redefined by its political masters." He describes a fascinating process of reconstruction, in which (with additional help from a devastating fire in 1917) Greek archeologists and historians set out to create "new forms of historical memory," redesigning the city to emphasize its classical and Byzantine past. Mazower resolutely examines the processes of selective scholarship: Archeologists, he tells us, published learned articles about the ancient inscriptions on the reverse side of Jewish tombstones, while ignoring the inscriptions in Hebrew, Portuguese or Spanish. State funds were not assigned to Ottoman sites until the 1980s, while Greek history books presented an image of a country whose sense of Hellenistic identity was eternal, instead of examining its complex evolution. "Nation-states," writes Mazower, "construct their own image of the past to shore up their ambitions for the future; forgetting the Ottomans was part of Greece's claim to modernity." Without melodrama or moral exhibitionism, Mazower's scrupulous witness to the experiences of each major group that made up the fabric of Salonika is an act of compassion for their suffering, a recognition of their gifts and aspirations, an acknowledgment of their common humanity. His account of what the Muslims created in Salonika — and what they too endured, as they were forced from their homes — gives weight to his criticism of a "fundamentally instrumental conception of history" that functions in the service of ideology. In a way, his book is a fragment of the Salonika that might have been. Paul, the saint so intimately associated with the city, may have most aptly described this quality of work: Mark Mazower is a scholar who "rejoices in the truth." Salonica: City of Ghosts by Mark Mazower (Knopf, 476 pp., $35). Mark Mazower, a scholar of Greek and Balkan history who teaches at Columbia University, has produced a hefty volume that will stand as a major, if incomplete, popular history of one of the most remarkable urban communities ever to exist. That is the port on the Aegean, known to its original Macedonian and Greek inhabitants as Thessaloniki, to its later Jewish, Turkish, and Albanian residents as Selanik, to the peoples of its Slav hinterland as Solun, and to the rest of the world as Salonica. The city was a prize sought by many a military adventurer over the millennia, but the most remarkable chapter in its epic doubtless began at the end of the fifteenth century, with decisions by the Ottoman sultans to rescue the Jews expelled from Spain and Portugal. The Sephardic Jews were resettled throughout the Turkish empire, but Salonica became their center, remaining more than three-quarters Jewish until the first decades of the twentieth century. With the Greek defeat of the Turks and the withdrawal of the Muslim power, the Sephardim were soon found to be a nuisance rather than an asset. A terrible fire destroyed most of the city's center in 1917, and in 1943 the Nazis transported the great majority of the remaining Jews to the flames of Auschwitz. Ottoman Salonica was a special place in which religion, identity, and law were remarkably fluid. The Islamic mystics of the Sufi orders, the Christian worship of saints, and Jewish esoterism drew the people of Salonica together, rather than separating them, and many cases were known of those who stepped back and forth between the three faiths without much trouble. Salonica is indeed a city of ghosts today, which is a pity, for its past offers much to study. Mazower has made a major contribution, with only a few minor errors and gaps--above all, he might have given more attention to the Jewish theological legacy of Salonica, which is considerable. But this is a book worth reading by anybody interested in the coexistence of Islam, Judaism, and Christianity--and interested in a single small but glorious place.